NGC 2623, pictured in this Hubble Space Telescope image, is in the late stages of a galactic merger between two spiral galaxies. The forces of the collision have fueled star formation in both galactic tails. In a new Hubble Space Telescope image, what appears to beone galaxy is actually the product of a collision between two Milky Way-likespiral galaxies. 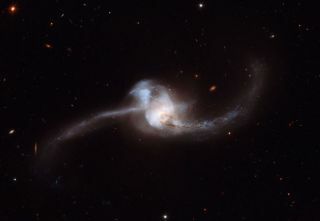 The result is a galacticmerger called NGC 2623, or Arp 243, and it is about 250 million light-yearsaway in the constellation of Cancer (the Crab). Studies have revealed that as galaxies approach one another,massive amounts of gas are pulled from each galaxy towards the center of theother, until ultimately the two merge into one massive galaxy. NGC 2623 is in the late stages of the merging process withthe centers of the original galaxy pair now merged into one nucleus. Stretchingout from the center are two tails of young stars, showing that a merger hastaken place. During such a collision, the dramatic exchange of mass andgases initiates star formation, seen in both the tails. The prominent lower tail is richly populated with brightstar clusters ? 100 of them have been found in Hubble observations. Theclusters are brighter than any seen in galaxies closer to our own. These starclusters may have formed as part of a loop of stretched material associated withthe northern tail, or they may have developed from debris falling back onto thenucleus. In addition to this active star-forming region, bothgalactic arms harbor very young stars in the early stages of their evolutionaryjourney. Some galactic mergers (including NGC 2623) can result in an activegalactic nucleus, where one of the supermassive black holes found at thecenters of the two original galaxies is stirred into action. Matter is pulledtoward the black hole, forming an accretion disc. The energy released by thefrenzied motion heats up the disc, causing it to emit across a wide swath ofthe electromagneticspectrum ? typically including everything from radio waves to visible lightto X-rays. NGC 2623 is so bright in the infrared, for example, that itbelongs to the group of very luminous infrared galaxies (LIRG). The images of the merger were taken in 2007 by the AdvancedCamera for Surveys (ACS) aboard Hubble.